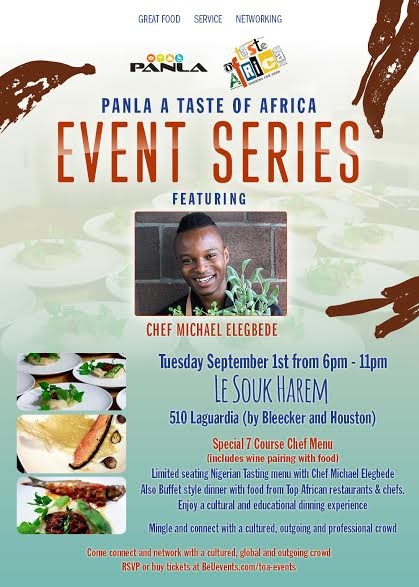 Attend CHEF TABLE - PANLA A TASTE OF AFRICA EVENT SERIES , 6:00 PM - 11:00 PM on Tue, Sep 01 2015 @ Le Souk , New York, USA Panla A Taste of Africa Event Series - with Chef Michael Elegbede - Join us in experiencing a cultural and educational dinning event with Chef Elegbede's creative approach to Nigerian cuisine. Connect with a global, cultured & outgoing crowd - Eat, Drink, Dance and more. Tuesday September 1st at Le Souk Chef Michael Elegbede presents a 7 course Nigerian tasting menu with wine pairing. Limited seating available. Seating starts at 6pm. Dinner to start at 6.45pm. Your purchase of tasting dinner also gets you a free ticket to buffet style menu - you can either give the buffet dinner ticket to a friend or pack your buffet dinner to go. Music - Afrobeats and more by DJ Universe and DJ SM - come ready to dance and meet new friends. Buffet style dinner from some of the top African restaurants in New York as seen on Forbes.com - Including Farafina, Le Souk, Queen of Sheba and more. Food tickets may be more at the door. Get your tickets today. Part of the proceeds of this event will benefit GC4W - when you buy your tickets today part of the proceeds will go to support the Global Connections for Women Foundation's (GC4W) New School Development Project for the Disabled Girls in Karamajiji, Abuja, Nigeria. 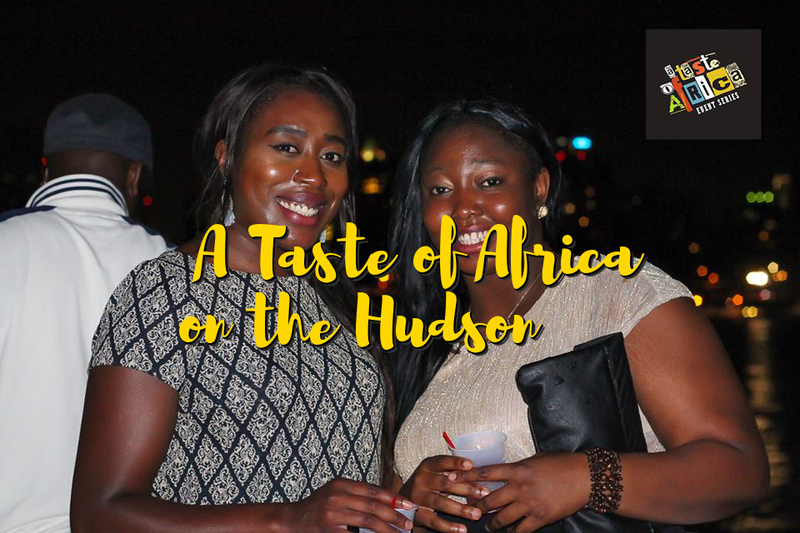 Panla A Taste of Africa Event Series - with Chef Michael Elegbede - Join us in experiencing a cultural and educational dinning event with Chef Elegbede's creative approach to Nigerian cuisine. Connect with a global, cultured & outgoing crowd - Eat, Drink, Dance and more. Tuesday September 1st at Le Souk Chef Michael Elegbede presents a 7 course Nigerian tasting menu with wine pairing. Limited seating available. Seating starts at 6pm. Dinner to start at 6.45pm. Your purchase of tasting dinner also gets you a free ticket to buffet style menu - you can either give the buffet dinner ticket to a friend or pack your buffet dinner to go. Buffet style dinner from some of the top African restaurants in New York as seen on Forbes.com - Including Farafina, Le Souk, Queen of Sheba and more. Food tickets may be more at the door. Get your tickets today. Part of the proceeds of this event will benefit GC4W - when you buy your tickets today part of the proceeds will go to support the Global Connections for Women Foundation's (GC4W) New School Development Project for the Disabled Girls in Karamajiji, Abuja, Nigeria.